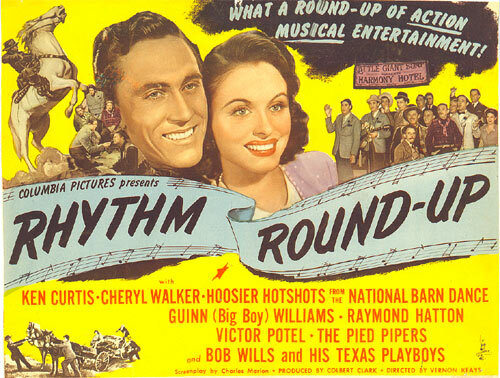 RHYTHM ROUND-UP (1945 Columbia) Not available for viewing. 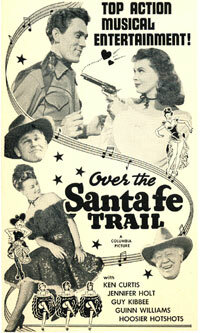 Columbia had been trying to get the right combination of performers for their light-hearted, modern-day western series beginning with “Swing in the Saddle” (‘44). Tom Tyler didn’t quite fit as a “lead” with the Hoosier Hot Shots in “Sing Me a Song of Texas” (‘45) nor did the 3 Stooges and Jay Kirby with “Rockin’ in the Rockies” (‘45). Producer Colbert Clark put it all together by adding Ken Curtis to the mix in “Rhythm Roundup” (‘45) (unfortunately, a “lost” film). 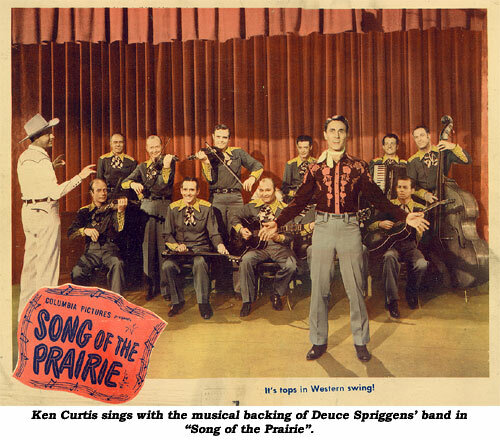 “Song of the Prairie” is the second with Curtis and the Hot Shots and is more of a musical revue wrapped around a slim story about Ken and the Hoosiers trying to open their own Barn Dance. The gang’s all here—Big Boy Williams, Jeff Donnell, Andy Clyde, Carolina Cotton, Deuce Spriggens and his band. The plot jumps around too quickly as if scenes were missing and the music is totally forgettable except for the cheerful “Song of Idaho” (reused for the title tune of a later Hot Shots picture in ‘48). The wacky Hoosier Hot Shots (Gabe Ward, Ken Trietsch, Paul “Hezzie” Trietsch and Gil Taylor) starred in 17 musical-comedy westerns for Columbia between ‘44-‘48. 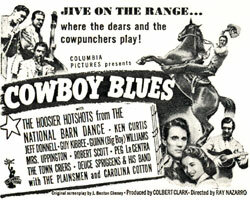 Ken Curtis co-starred in eight of them. One of the neatest things about several of these films is to watch all the real fun Jeff Donnell is having. (She was in five.) 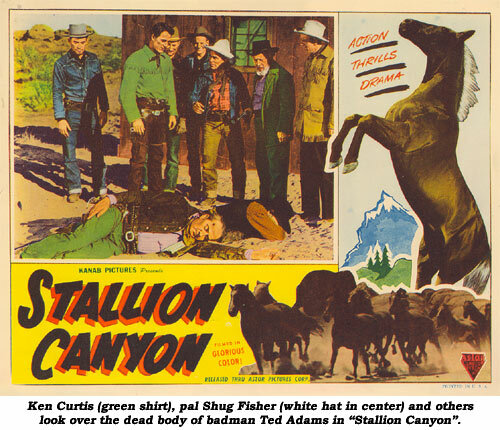 “Throw a Saddle…” has a weaker storyline than most, if you can really say these films ever actually had a storyline. They’re mostly wild ideas on which to hang some music. Here, rodeo champ Ken must ride Dynamite in the big rodeo to save the ranch for his Pop, Andy Clyde. Ken’s pal is Big Boy Williams. Foy Willing and the Riders of the Purple Sage help out too. Title song is written by Andy Parker, others by Tim Spencer, Cindy Walker and Fleming Allen with the highlight of the show being Andy Clyde and Jeff Donnell’s duet of “Bonny Bonny Braes of Wyoming”. Ken Curtis croons, the Hoosier Hot Shots clown and amidst all the music Sheriff Ken and Deputy Big Boy Williams manage to close down and run out of town a crooked gambling joint after a musical jamboree mayoral election. Deuce Spriggens, Carolina Cotton, Andy Parker and the Plainsmen do an energetic job on Bob Nolan’s “When Payday Rolls Around” and Ken offers an engaging version of Spriggens’ “Trail To San Antone” with Parker and the Plainsmen. It’s the old Gene Autry plot. Ranch handyman (Guy Kibbee) has told his daughter (Jeff Donnell) who’s been back east in school, that he’s a big ranch owner. 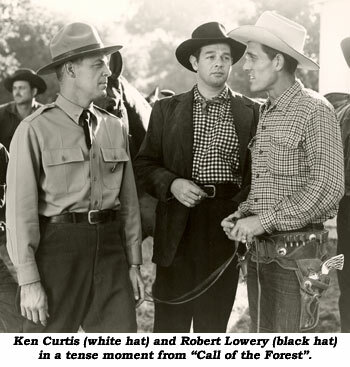 Daughter shows up out west unexpectedly with her fiancé so the ranch manager (Ken Curtis) and the boys (the Hoosier Hot Shots, Big Boy Williams) make believe Kibbee really owns the ranch. Trouble sets in when the real owner pops up. Also with Carolina Cotton, Deuce Spriggens Band. Over a dozen songs. With their mix of music, comedy and a little adventure, this series of Ken Curtis/Hoosier Hot Shots “westerns” were most certainly an acquired taste. Many fans still refuse to watch them to this day. Swindled out of $50,000 by eastern slickers, crusty old Guy Kibbee vows revenge and heads for the dude ranch they own. 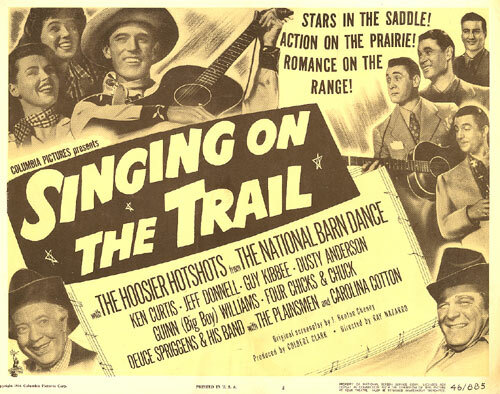 Getting wind of Kibbee’s arrival, the city slickers pull another fast one, making entertainers The Hoosier Hot Shots believe they’ve bought the ranch. Kibbee, of course, believes the Hot Shots are in league with the swindlers. The Hot Shots, looking for a bodyguard, hire cowboy Ken Curtis (and his pal Big Boy Williams) whom they believe is a two-gun man but is actually only a singer looking for a job on the dude ranch. Modern western horseplay as returning GI Ken Curtis and his pals, the Hoosier Hot Shots, make plans to convert their old radio station into a TV station. The plot is just something to fill in between some 12 songs by Merle Travis, Judy Clark (a junior Betty Hutton), the Hot Shots and Curtis. 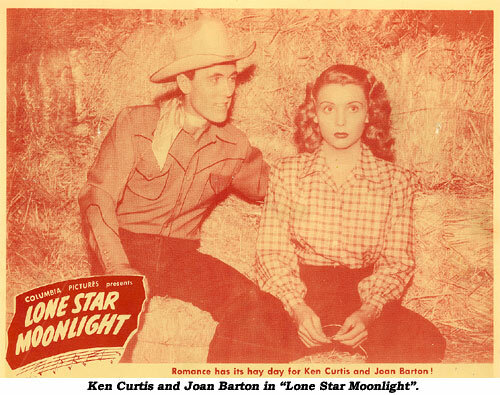 A truly “old west” Ken Curtis/Hoosier Hot Shots B, rather than a modern-day dude ranch musical. The Hot Shots and sisters Jennifer Holt and Noel Neill are troupers with a traveling medicine show. 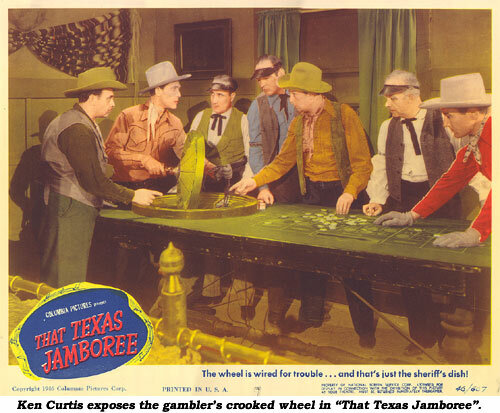 After rancher Curtis and his saddle-partner Big Boy Williams encounter the entertainers, they begin to suspect someone on the show is in league with a gang of bank robbers who have hit banks in every town the medicine Show has played. Watch for Jock Mahoney as a deputy. In stock footage from a Durango Kid film, you can spot Smiley Burnette riding out of town with a group of riders. Ken Curtis is defeated not by bad guy John Dehner but by the completely amateurish production qualities—poor script (a good deal of it narrated), deficient acting and some of the worst photography you’ll ever see. Much of the film was shot silent with sound (poorly) dubbed in later. Even when Ken and pal Shug Fisher sing several traditional cowboy songs, there’s absolutely no spark to this boring mess. It’s the only film Michael Salle ever directed, and it’s easy to see why. Originally in color, only b/w prints seem to exist today. 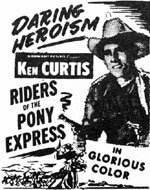 Not to be defeated by “Riders of the Pony Express”, Curtis tried again, this time under the helmsmanship of old low budget director Harry Fraser, and the results were certainly much improved. It’s the standard badguy after the ranch plot with the wild horse plot and a horse race to save the ranch thrown in for good measure. Leading lady Carolina Cotton is absolutely wasted, not being allowed to sing or yodel a note. Filmed in color at Kanab, UT, but color prints don’t seem to have survived. Producer Ed Finney has found another outlet for his wild horse footage he used before in “Silver Stallion” and “King of the Stallions” in this part western, part wildlife adventure rambling patchwork of disjointed scenes and stories. Basically, a young boy joins his father (Curtis) out west where Dad has just captured a wild stallion for him (Black Diamond). Dad, to make ends meet, searches for a lost gold mine which his “pal” also wants. Ken gets to show off his two-gun tricks and sing two traditional western songs. The horse, Black Diamond, is best known for his role as “Fury” on TV. “Don Daredevil Rides Again: cut back on the inflationary production costs at Republic for serials by utilizing stock footage from “Zorro’s Black Whip” (‘44). 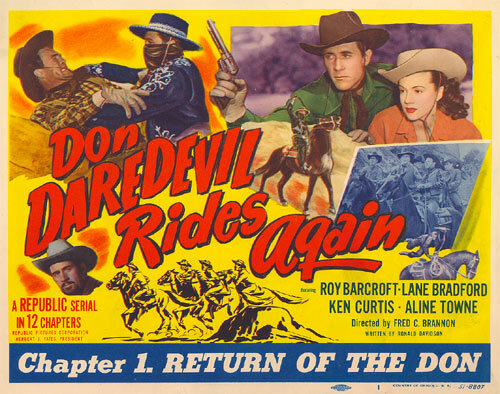 Republic could no longer make a new Zorro serial as the rights to the character had expired in ‘50, so they used the costume and renamed Ken Curtis’ character Don Daredevil. Another cost-saver for Republic by this time was the drastic reduction in the supporting cast. For 12 chapters Don Daredevil fought, over and over, political boss Roy Barcroft and his two henchies, Lane Bradford and John Cason, as the crooks tried to overturn by devious means original Spanish land grants. Problem with Ken Curtis was the same as in his Columbia westerns; he was just a little smallish and a bit low-key for an action hero. 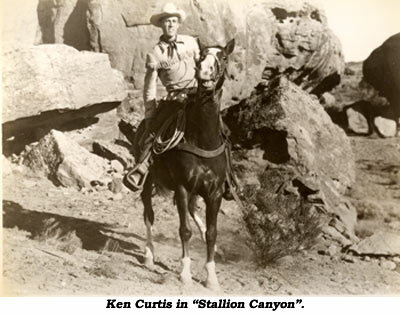 Curtis finally came into his own (as an actor—he was always a fine singer) as Festus on TV’s “Gunsmoke”.